The Côte d'Azur, or French Riviera, is located in the southeast corner of France, bordering on Italy. To enhance your stay when planning a vacation in the area, learn the pertinent information city-by-city of the region and key tourist activities to explore. The French Riviera starts with France's largest resort town, Nice. Just to the west of Nice center is the Nice-Côte d'Azur Airport, close to town and a convenient arrival point to visit tourist destinations in the area. From the airport, there are several shuttle buses and local bus services to Nice and other Riviera cities. Taxis are a more expensive option for transit. Nice also has three rail stations but, the main terminal is located a few blocks north of the coast at Nice Ville. The town of Nice is known for its stunning vistas overlooking the ocean. Travelers can find fantastic shopping around Vieux Nice, lounge by the sea by the Promenade des Anglais, or take a leisurely stroll along the Pedestrian Zone. Clustered around Nice are some compelling destinations for anyone who doesn't like traveling far from an airport or train station. St. Paul de Vence is an adjacent hill town—away from the sea for anyone tired of endless beaches—with tours and attractions, including the amazing Maeght Foundation Modern Art Museum. Check into the rural Hôtel Marc Hely for an enjoyable and quiet stay when exploring the area around St. Paul de Vence. Villefranche-sur-Mer is just minutes from Nice and offers a wonderful beach and market. Transport is by train is very convenient. Antibes has a fantastic food scene, steeped in local Mediterranean traditions. The Old Town boasts dozens of quaint bistros offering regional specialties like bouillabaisse. Antibes' Port Vauban is the largest yachting harbor in Europe, and it is perfect for for boat-watching. The town is also home to a legendary jazz festival. If you're inclined to attend this unique music event, purchase tickets early as the event always sells out. The world-famous Musée Picasso in Antibes is a huge tourist attraction for art-lovers. 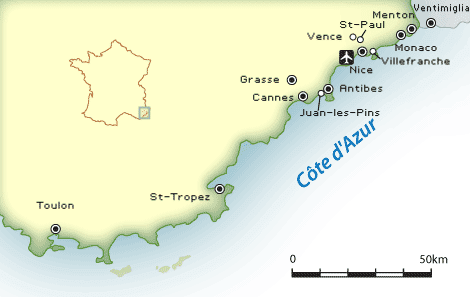 All 0.7 square miles of the tiny country of Monaco is embedded along the Côte d'Azur. Take a picturesque Shore Excursion around town to catch some rays and see the sights. Monaco is synonymous with luxury in the South of France—think Beverly Hills on the Mediterranean – but you won't have to break the bank to have a good time. While there are pricey options in places like Monte Carlo, attractions such as The Princess Grace Rose Garden are free of charge. Near Monaco is the medieval hill town of Roquebrune, recommended highly as a place to spend a few days for folks interested in very old castles, great food, and beautiful countryside hikes. Menton, near the border of Italy, is known primarily as a flower town, much like the Ligurian coast to the east. If you're craving Italian food and don't want to cross the border, you'll find it in Menton. Be sure to visit the Serre de la Madone Garden at Menton, as well as museums such as the Musée Municipal. Cannes is known for its famous film festival, but you'll want to check out some of its other top attractions, like visiting the Iles de Lérins islands or the homage to the Man in the Iron Mask at the Museum of the Sea. If you are not staying at one of the magnificent hotels, for a nominal cost, you can rent a lounge chair and umbrella on one of the private beaches belonging to the property. Another small flower town, Grasse is known for its perfumes, soaps, and other scented products. For that reason, it could be perfect for a romantic afternoon away from the main stretch of the Côte. St. Tropez is a popular French Riviera vacation spot made famous by Brigitte Bardot in the fifties and has been home to the "jet set" ever since. Perhaps its most famous beach is Plage de Tahiti, a naturist beach where you can work on your all-over tans with beautiful people. "Saint Trop',", as the locals call it, is home to many fancy hotels. If you're looking for a splurge, a stay at one of the stunning hotels in St. Tropez is well worth the expenditure.